#1 7 Generations of San Franciscans and visitors have enjoyed the Natural Beauty of our world-renowned Park. A Toxic Astroturf Stadium is a bad plan for the next 7. #2 “Boss Gardener” John McLaren, the Park’s manager for 53 years, had a motto–”Work with Nature, never against Nature”. We should insist on growing good old-fashioned American Grass in our Park–not plastic and waste tires. #3 Golden Gate Park was designed as a Journey–away from urban stress to the shores of the vast Pacific Ocean. It was not intended as a series of rental units and corporate sponsored venues. #4 700,000 pounds of waste tire crumb infill (for $261,505) made from special recipes of petroleum products, industrial solvents, additives, and heavy metals known to cause cancer and developmental disorders is not a good deal for our Environment. #5 A disposable plastic field covering (the equivalent of roughly 4 million plastic water bottles or 9 million plastic shopping bags) which will degrade into a trillion pieces of plastic less than 1000 feet from the Pacific is an Environmental Nuisance. We don’t need a 6th Gyre at Ocean Beach. #6 Nighttime sports field lighting (150,000 watts or 30 households worth of power) on until 10pm every night will disrupt the breeding cycles of birds on the Pacific flyway. Light pollution is stressful for all animals, including humans. #7 Toxic Turf is injurious to Athletes of all ages. Increased incidences of joint and repetitive stress injuries, opportunistic infections from abrasions, and recent studies of increased cancer risk in soccer goalies are all indicated by play on Toxic Turf. #8 Of special concern are endocrine disruptive chemicals (EDC’s) in Toxic Turf. These chemicals–Polycyclic Aromatic Hydrocarbons, or PAH, and heavy metals such as lead–have been noted as an environmental cause for Hyperactivity/Attention Deficit Disorder and Autism. Young children and pregnant women are especially at risk. Toluene, used in the production of methamphetamine and found in airplane glue is one of the solvents off-gassed from Toxic Turf fields. #9 A group of Women’s World Cup Soccer Players have filed a lawsuit to play 2015 matches on real (Canadian) grass. They claim human rights violation as no other World Cup matches have been played on plastic. They state that their health is important and the nature of the game itself is different (inferior) on artificial surfaces. #10 Every Drop of Rain Flushed down the Drain (more than 4 million gallons/year). The Beach Chalet Fields are over the Westside Groundwater Basin. This water is used for irrigation and will soon be added to the City’s potable drinking water supply. The Toxic Turf developers say the proposed fields are safe, but they will install a hazmat liner underneath to protect the Groundwater Supply. If the liner holds, every drop will be withheld from the aquifer and wasted to the combined sewer system and taxpayers will pay for treatment. The Environmental Impact Report states that what’s in the runoff from the Toxic Turf is “unknown” and “could degrade groundwater quality” and that “polluted runoff” is a “potentially significant” impact. #11 Toxic Waste Trails from the project will be created as plastic and chemical bioaccumulators in the waste infill migrate from the fields to surrounding areas. #12 In times of heavy rain, the high-volume of polluted runoff from the fields added to what’s in the combined sewer system will overflow on San Francisco’s beaches (more than 1.5 million gallons sewerage overflow/year) . #13 As an attorney who worked on the case put it, “thuggery and manipulation” by “SF political authorities” and “SF statewide elected officials” contributed to the fact that the California Coastal Commission chose simply to ignore their staff’s report which would not have permitted the Toxic Turf Stadium complex. Or, as he more succinctly put it, “THIS WOULD NOT HAVE BEEN PERMITTED IN ANY OTHER COASTAL LOCATION, OR ANY OTHER COASTAL COMMUNITY, IN CALIFORNIA”. #14 Having set a dangerous precedent for the California Coast with this Toxic Turf Stadium project, what’s next for the California Coast? Wall-to-wall condos? Luxury hotels? #15 Regulatory Capture–the control of governmental oversight by those who are being regulated–is the death knell of democracy. This is a clear case of that. Does that mean we say goodbye to the Coastal Act? To the 40 year long endeavor to Protect Our Coast for all Californians and for future generations? 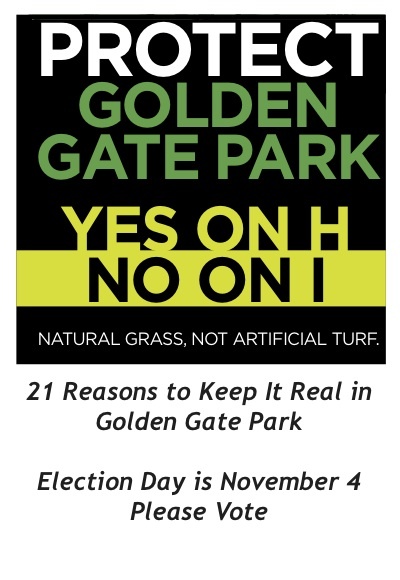 #16 In response to the Citizens’ Ballot Measure Initiative to Protect Golden Gate Park (which more than 15,000 people signed). SF Supervisors under the direction of the Mayor filed a competing Fake Fields Initiative (Prop I). Prop I says that if it gets more votes, it kills the Citizens’ Initiative. A Poison Pill. Filling the ballot with measures intended to confuse voters is an old trick used by political hacks. The fact that this nuclear option was chosen shows that the fight is about more than Letting SF Kids Play. #17 Prop I also would hand over more Administrative Authority to Rec and Park management based upon their phoney inventory scheme for park “usage”. If we didn’t have to pay to play everywhere or to get through a chain link fence, our parks would get a lot more use. #18 There are concerns that as it’s written, Prop I would limit the Citizen’s Initiative Process (First Amendment right to petition) and would limit other legal recourse such as the California Environmental Quality Act (CEQA) (Fourteenth Amendment right to due process). Prop I is an assault on our Constitutional Rights. #19 The investors (City Fields, whose donors include the Fisher brothers of GAP, Charles Schwab, and Bechtel) in the private-public partnership behind Astroturfing our Parks are looking for returns. Prop I is fully funded, at nearly $500K by the Fishers. The new model of philanthropy is rife with privatization schemes. With investments and sponsorship interests in pro sports (including both women’s and men’s pro soccer) and cash for trash, evidence points to the fact that these corporate mogul donors wish to be the proprietors of Our Parks. Worse yet, taxpayers will be on the hook for replacement of their “donated” fields. They are disposable. It’s probably best to dispose of the Memorandum of Understanding by which this cozy partnership exists. #20 The use of children (soccer kids, let kids play) to perpetrate this privatization scheme is unsavory. We must hold our elected and appointed officials accountable for their roles in the decision-making process to use questionable materials such as tire derived products in places where children play. We should demand that taxpayer money that funds programs (like grants for use of waste tires on play fields) at the state level and kicked-back to the local level is used responsibly and that there is transparency in accounting. #21 We deserve better than plastic and toxic tire waste in our Parks. We deserve better than “They took all the trees/ Put ’em in a tree museum / And they charged the people/ A dollar and a half just to see ’em”. “Don’t it always seem to go/ That you don’t know what you’ve got/ Till it’s gone”–let’s keep what we have left of Nature in the City. Don’t Let SF Kids’ Play be Privatized.